Audi has revived the quattro name for its new hybrid Le Mans 24 Hours challenger. 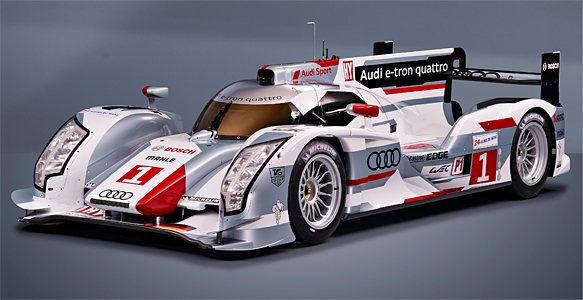 The hybrid version of the German manufacturer's turbodiesel LMP1 coupe will be known as the R18 e-tron quattro. It takes the name because its hybrid systems recover kinetic energy and return it to the track through the front axle. The R18 e-tron, which will also race in the new FIA World Endurance Championship, becomes a four-wheel-drive car within certain limits laid down in the Le Mans rulebook. The regulations allow 500kJ (approximately 70bhp) of stored energy to be transfered to the wheels between two braking 'events' at speeds above 120km/h (75mph). The rules allow energy retrieval on only one axle. The advantages of choosing the front wheels include improved traction and greater efficiency during the recovery process. Audi has chosen to use a flywheel or accumulator for energy storage rather than batteries or the super-capacitors favoured by rival Toyota. The flywheel has been developed by Williams Hybrid Power, which also produced the unit in sister marque Porsche's 911 GT3-R Hybrid. I really want to see a kinetic KERS system working well. It would make things a whole lot easier than lugging around a lump of battery and would also be a fairly cheap alternative to transfer to road car manufacturing with a longer life than the current battery hybrids. Is it just me or are the front wheel arches HUGE compared to a usual LMP? is it possible they are using 2x fly-wheels? I thought the fly-wheel system was housed centrally using 1 wheel. Those fly wheel assemblies aren't that light, so there's no real weight savings to had versus battery based systems. Then with the added complexity of more moving parts, I dont see much of an advantage to this system. Still want to see more of this in racing though. It also looks like it has an F Duct for stalling the rear wing. The wheel arches are that big on the standard R18 - the trend in recent years has been for the LMPs to run rear tyres at the front and the Audis are no exception. As for flywheel KERS - for a system built to current F1 regs it's true it's not much lighter than a battery system, but increase the energy that can be harvested and the flywheel system starts to become lighter, requires less cooling and has higher efficiency. I believe that LM doesn't have a limit on how long the system can be deployed per lap (unlike F1 where it works out to 6.7sec/lap), only that output is 70hp max and the system can only be deployed once between braking events.